The San Francisco 49ers - the epicenter of the national anthem debate - kick off the formal football season Monday night at Levi's Stadium in Santa Clara against the Los Angeles Rams. In addition to the annual excitement around this American fall rite of passage, this year, a lot of the buzz is also surrounding what 49ers quarterback Colin Kaepernick has been doing, or rather, not doing. Since Aug. 28, Kaepernick has been sitting or kneeling during the national anthem. It's a symbolic protest, he has explained, to stand up for what he sees as racial injustice and police brutality in the United States. He has received much scorn. And much support. The number of players, from professional to high school, mirroring his silent protest has been growing. And on Monday, a group called the "Courage Campaign" is expected to fly a plane banner over the stadium to honor what Kaepernick is doing. 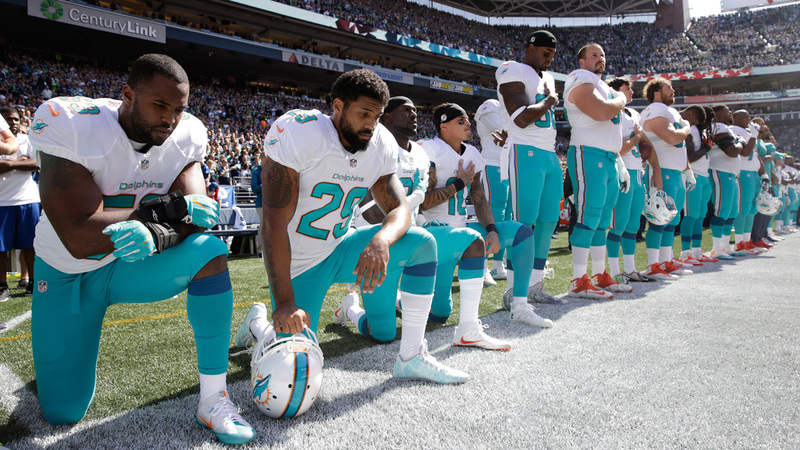 For instance, Kansas City cornerback Marcus Peters raised a black-gloved fist during the national anthem, a protest amplified later Sunday when four Miami Dolphins kneeled on the sideline with hands on their hearts as "The Star Spangled Banner" played in Seattle. Peters' gesture was the only one visible throughout the early games Sunday, as the anthems took on more significance because of the 15th anniversary of Sept. 11 attacks. And he gave a nod to his hometown in Oakland. The four Miami players — Arian Foster, Michael Thomas, Jenkins and Kenny Stills — registered their protest shortly before kickoff. The four players stood while President Obama's message played regarding the 15th anniversary of 9/11 before taking a knee. All four stood at the conclusion of the anthem. "He spoke up about something he felt he needed to speak up about," Peters said last week referring to Kaepernick. "I salute him for that." Broncos linebacker Brandon Marshall, a teammate of Kaepernick's in college at Nevada, took a knee during the anthem on Thursday night. A New Jersey high school team also took a knee before a game this weekend. Seattle players brought Dr. Harry Edwards, a professor emeritus of sociology at UC Berkeley, to help direct the conversations. That statue is now a centerpiece of San Jose State University, where the sprinters once attended.